Beautiful little Almond Tea Cakes with Wild Blueberry Jam are some of the best cookies we’ve ever made. I couldn’t be more proud of this new delicious recipe! Developing recipes in my head is always a lot easier than making those dream recipes come true in my kitchen. However this newly created recipe exceeds all my expectations by a mile! 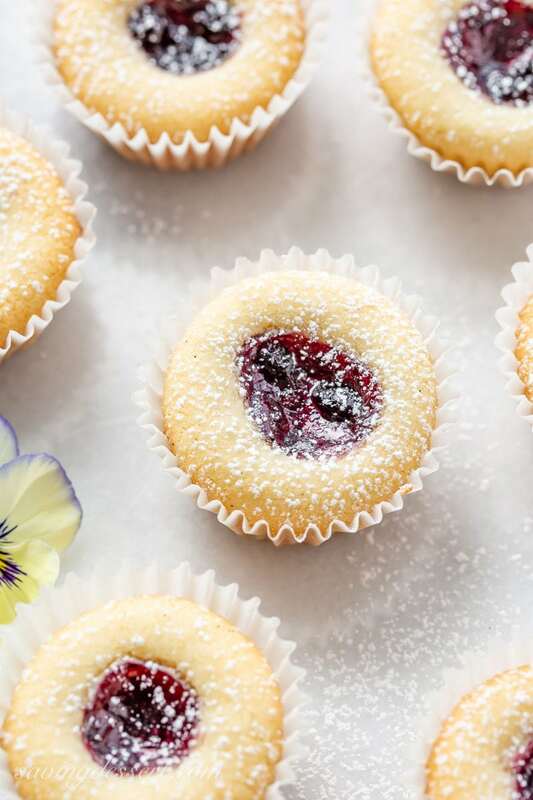 Like a cross between Mary Berry’s Viennese Whirls, a Russian Tea Cake Cookie and a buttery jam filled shortbread thumbprint, this hybrid is truly one of the best cookie recipes to ever come out of the SRFD kitchen! I adore these tender little buttery gems with loads of flavor from the almond extract and almond flour. 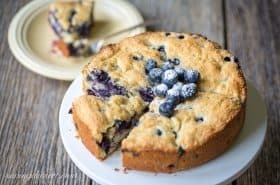 The combination of almond and blueberry is classic and so delicious. These tea cakes are an instant favorite and I’ve already thought of a dozen variations I can’t want to try. The texture is wonderful with a little nuttiness from the almond flour. I always keep a bag of almond flour on hand and store leftovers in the freezer. It keeps for up to a year when sealed in a ziploc container in the freezer. If you don’t have almond flour, grind blanched almonds into almond meal instead. This simple cookie dough is a breeze to make right in your food processor. There’s no need to refrigerate the dough before rolling into balls, or before baking. Rolling the dough takes a little time, but the results are worth the effort. Baking in small confectionary mini muffin baking cups prevents the dough from spreading which is a common challenge when making thumbprint cookies. These bake up beautifully and are easily removed from the paper wrapper. No sticking, I promise! If you don’t have a mini muffin baking tin, you can bake the cookies in the paper cups placed directly on a cookie sheet. The cookies will spread just a little more and be wider on the top. However, this is not a problem and they still look very pretty and bake perfectly. While rolling the dough into balls, it may feel like the dough is breaking apart and crumbling. If so, use a little less pressure and roll again, applying more pressure as the ball becomes firm. If the dough ball splits or cracks when creating the pocket for the jam, re-roll the ball applying light pressure at first, then more pressure as the ball becomes firm. The cookies are crumbly when they first come out of the oven but firm up as they cool. While they’re delicious eaten warm, they hold together better when cooled. 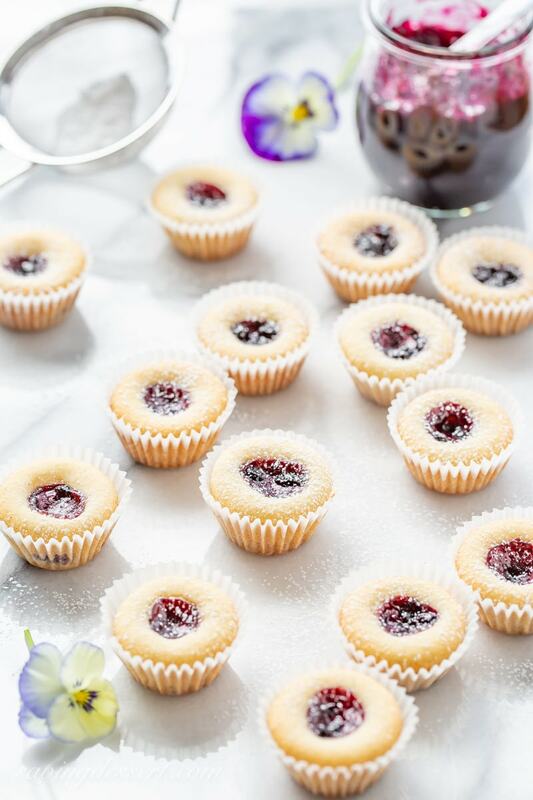 Use a small cookie scoop for the perfect size dough ball to fill the mini baking cups. Change it up and use your favorite jam for this recipe. 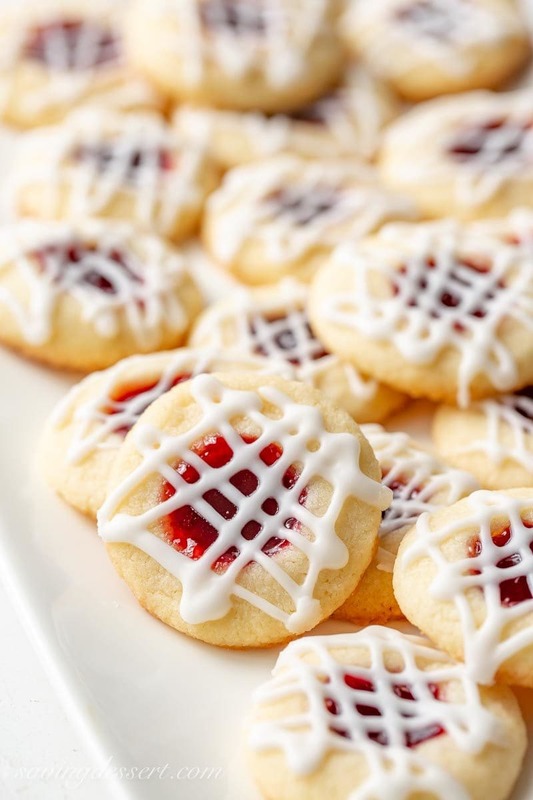 I don’t recommend using jelly in these cookies due to the higher amounts of sugar when compared to most jams. Jelly may burn or get so hot it sinks to the bottom of the cookie. Our favorite jam is made by Stonewall Kitchen. You can find their quality products in grocery stores, on their website or on Amazon. We use their Wild Maine Blueberry Jam for this recipe but strawberry would be great here, as well as peach. Or, use all three for a variety of flavors and pretty color variations. It’s all good! Let’s be baking friends! 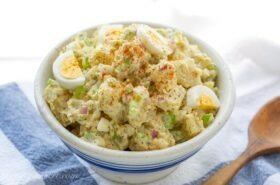 If you make our recipe please feel free to leave a comment on this post. I’m sure your experience and insights will help all our readers, and it helps me too. Also, if you’re on Pinterest feel free to leave a comment and photo there if you have one! If you share on INSTAGRAM tag @savingroomfordessert so we can stop by and give your post some love. And we’d be very happy if you’d FOLLOW Saving Room for Dessert on FACEBOOK| INSTAGRAM| PINTEREST | TWITTER and subscribe to our YOUTUBE channel for all the latest recipes, videos and updates. Thank you!!! 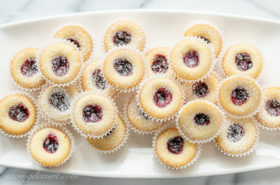 Pick up a package of these inexpensive mini muffin paper cups to make our Almond Tea Cakes with Wild Blueberry Jam. They’re the perfect size for the perfect bite! These little paper party cups are also ideal for serving candy and nuts, muffins, and even small cookies at the holidays. You’ll also want to pick up a small cookie scoop if you don’t have one. This little scoop makes the perfect size cookies for baking in the mini paper cups. Click on the photos for more information or to purchase from Amazon. 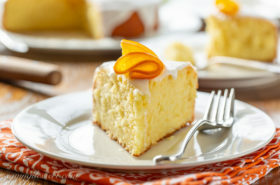 Saving Room for Dessert is a participant in the Amazon Services LLC Associates Program ~ I earn a small commission, at no additional cost to you, which I use to pay for web hosting and services for this blog. Thanks for supporting SRFD! Preheat oven to 350F. Line a 24 mini muffin tin with baking cups. Alternatively, line a baking sheet with the mini muffins cups spaced 2-inches apart. In the bowl of a food processor, pulse the flour, almond meal, sugar, baking powder and salt until blended. Add the butter, vanilla and almond extract. Pulse until the mixture becomes a soft dough. Using a small cookie scoop (flat - not heaping) roll balls of cookie dough into tight balls. With the cookie dough ball cupped in one hand, make an indentation with the pinky finger from the opposite hand into the center of the ball. Make the well half the depth of the dough ball, then place it in the baking cup, with the hole facing up. If the dough ball starts to crack or split, re-roll until it’s smooth, tight and pliable. Continue until the mini-muffin tin is full. 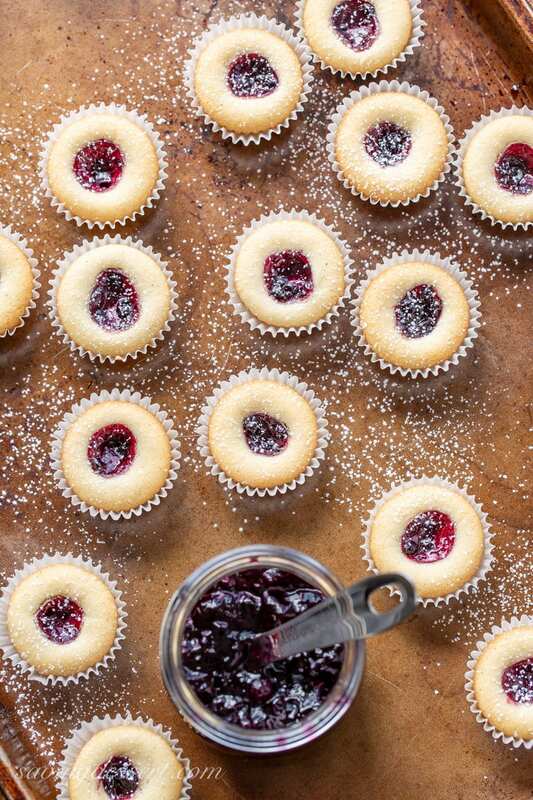 Fill each cookie with a heaping 1/4 teaspoon of blueberry jam. The jam should completely fill the indentation and be somewhat overfilled. Bake for 15 to 18 minutes or until lightly browned on the edges. Do not over bake! Allow the cookies to rest in the pan for 5 minutes, then transfer to a wire rack to cool. Once cooled, dust with powdered sugar. Store at room temperature in an airtight container. Cookies will keep for up to 5 days. If baking the cookies on a cookie sheet instead of in a mini-muffin tin, the cookies will spread just a little more, be wider on the top. This is not a problem and they still look very pretty and bake perfectly. While rolling the dough into balls it may feel like it’s breaking apart and crumbling. Use a little less pressure and roll again, applying more pressure has the ball becomes firm. If the dough ball splits or cracks when creating the pocket for the jam, re-roll the ball applying light pressure at first, then more as the ball becomes firm. The cookies will be crumbly when they first come out of the oven but firm up as they cool. While they’re delicious eaten warm, they hold together better when cooled. Substitute your favorite flavor of jam if desired. Not just for the holidays! 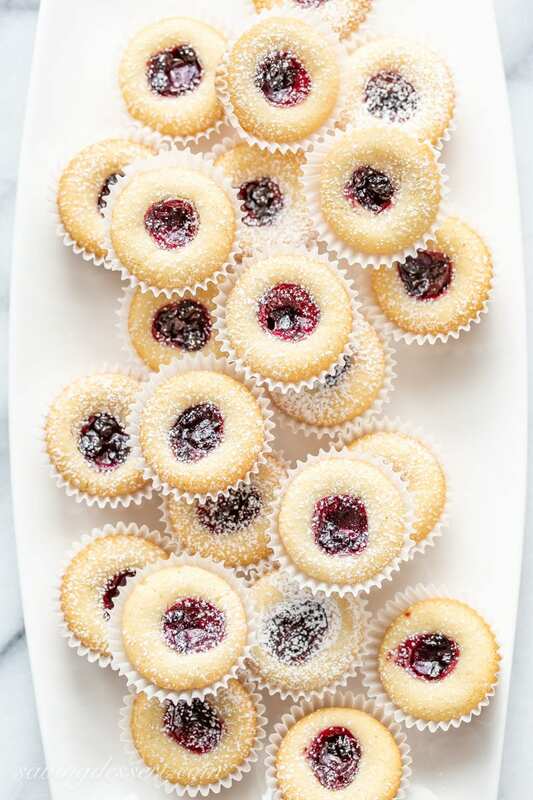 These pretty Raspberry Almond Shortbread Thumbprints are so delicious you’ll want to make them for every gift-giving opportunity, party, holiday, event, potluck and family extravaganza. 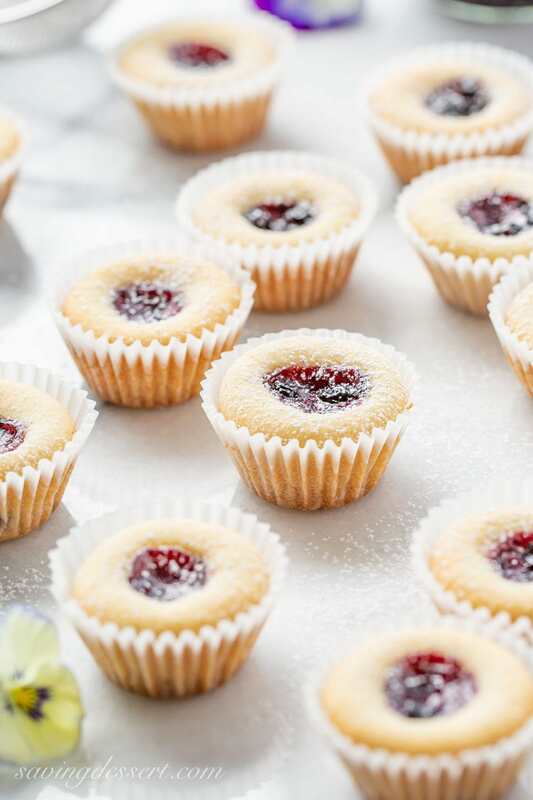 Click HERE to get the recipe for Raspberry Almond Shortbread Thumbprint Cookies. 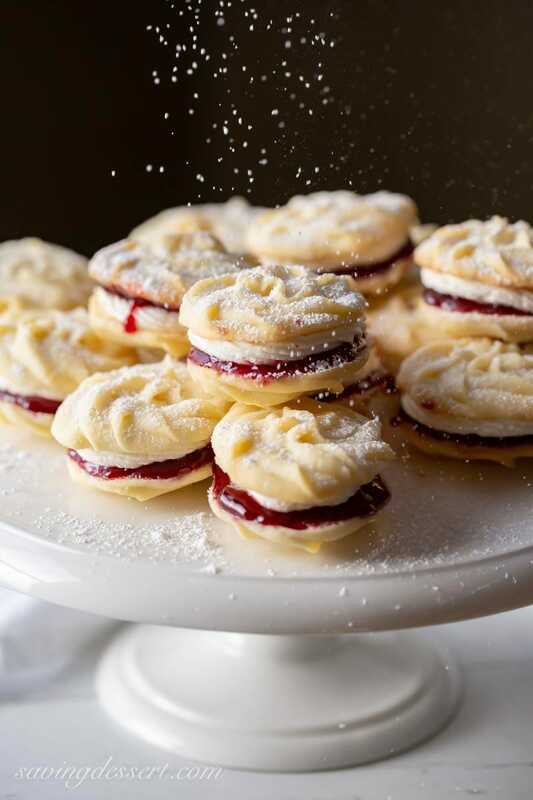 Mary Berry’s Viennese Whirls – enjoy these delicious, tender melt-in-your-mouth butter cookies slathered with raspberry jam and a light vanilla buttercream filling. 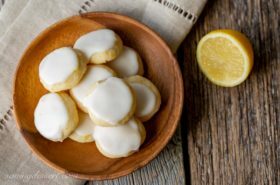 Click HERE to get the recipe for Viennese Whirls. So delectable and beautiful-looking, Tricia! I have a friend who is always having tea parties for her neighbors. I’m sharing your recipe with her, I know these will be perfect for her next party. Hi Sonia – sorry I don’t speak Spanish. If you want to translate – just copy and paste into a translation app on your phone or computer. Good luck! YUM! These cakes are adorable! Perfect for brunch! Haha – nope! But I’ve been baking a long time Larry – sweetest comment ever! These look so cute. Can’t wait until I have a reason to make them. I was wondering if they could be piped or is the mix more dry than wet enough to put through a piping bag. These little gems are so gorgeous! You are an amazing baker, Tricia. Thank you Angie – you’re the one that’s an amazing baker! Woo hoo! Love these little gems, Tricia! They’re pretty and delicious too for sure. Blueberry rules!!! You’ve invented a cookie ~ you are an amazing baker Tricia, and I literally can’t wait to try these. What a cute Easter treat they’d be! You are too kind Sue! I hope you get the chance to make these sometime and I bet you don’t want to share! You make some wonderful cookies, Tricia! If you say these are the BEST of the best, I definitely have to try them. They look amazing! Thanks Chris – this is a keeper!